A quick and easy summer dessert, this Eton mess recipe is very much a summer pudding and it is easy to make in just five minutes, if you buy ready made meringues from the supermarket. 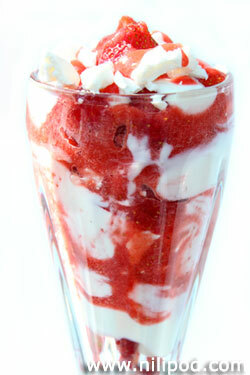 Perfectly ripe fresh strawberries will make this pudding simply delicious. 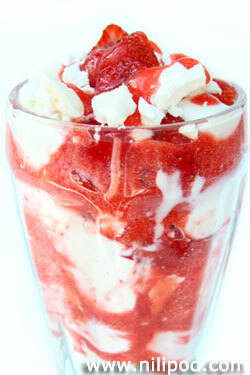 However, if you only have frozen strawberries, then they will still make a very nice Eton mess - it will just be a bit different, as the fruit will be softer once it has defrosted. Whipped cream is traditionally the main ingredient, while if you are looking to make something a bit healthier, then try swapping this ingredient for some Greek yoghurt instead, or perhaps some creme fraiche. Remove the green leaves from the strawberries before lightly rinsing them. Roughly chop the strawberries, leaving around half a box for later on. 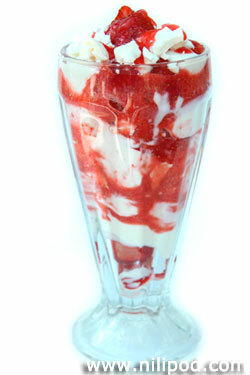 Sprinkle the chopped fruit with the caster sugar and then get yourself the cream. Using an electric mixer, whisk up the double cream until it has firmed up nicely, forming peaks when you remove the whisks. Now, blend up the remaining half a box of strawberries in a liquidiser blender or food processor, together with the icing sugar, to make a rich sauce called a 'coulis'. Crush up the meringue nests (the easiest and most fun part of the recipe), being sure to leave some large lumps for an added crunch. Mix together the crushed meringue pieces with the cream, and stir in the majority of the chopped strawberries and sauce, leaving a little to garnish the top with. 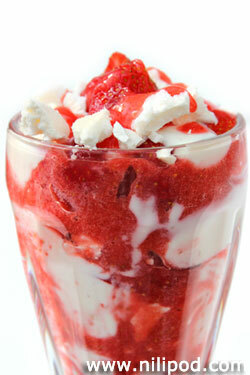 Either serve your Eton mess in individual glasses or dishes, or as a large bowl where people can help themselves.